Cristiano Ronaldo is leaving Real Madrid to join Italian club Juventus, bringing to an end a hugely successful nine-year spell in Spain. Madrid said Tuesday it has reached an agreement with Juventus after a request by Ronaldo. No financial details were disclosed but Italian media reports Juventus is paying Madrid 105 million euros ($ 123 million) for the 33-year-old forward. "Real Madrid wants to express its gratitude to a player who has proven to be the best in the world and who has marked one of the greatest eras in the history of our club and of world soccer," the club said in a statement. Ronaldo is currently on vacation in Greece following Portugal's elimination from the World Cup. Juventus president Andrea Agnelli flew out Tuesday to meet the five-time Ballon d'Or winner. Ronaldo joined Real Madrid in 2009 from Manchester United and was the Spanish club's all-time leading scorer with 451 goals in 438 matches. He helped the club win four Champions League titles — beating Juventus in the final in 2017 — and also won the league and cup twice each. "In addition to the titles he won, Cristiano Ronaldo has been an example of dedication, work, responsibility, talent and determination," Madrid said. "For Real Madrid, Cristiano Ronaldo will always be one of its greatest symbols and a unique reference for the next generations. Real Madrid will always be his home." Ronaldo signed a five-year deal with Madrid in 2016, saying he wanted to end his career at the club. 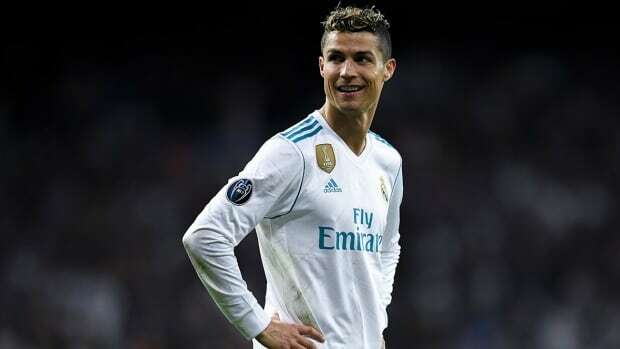 But he has also publicly expressed his discontentment about being jeered at times by some Madrid fans at the Santiago Bernabeu Stadium. Ronaldo was also moved by the Juventus fans for giving him a standing ovation after he scored a spectacular goal against the Italian club at the Allianz Stadium in the Champions League quarterfinals last season. Ronaldo made his debut for Sporting Lisbon when he was 17. His crossover dribble was already famous when Alex Ferguson brought him to Manchester United ahead of the 2003-04 season and gave him the No. 7 shirt of the recently departed David Beckham. He spent six seasons in England, winning three Premier League titles, one Champions League title and one FA Cup. Ronaldo led Portugal to its first major title at the European Championship two years ago in France. He helped the Portuguese team reach the semifinals in his first World Cup in 2006. Portugal was eliminated by Uruguay in the round of 16 of this year's tournament in Russia. Ronaldo scored four goals to take his tally to 85 for his country and break Ferenc Puskas' record as Europe's all-time leading international scorer.